Insadong, in some sense, represents the cross road of the old and the new of Korea. The lives of the old is alive in fragments in the antique furniture, china, sundry things that await the prying eyes that anc appriciate them as such. What remains from the lives before, what maybe is disappearing in the frenzy of modernity is lurking hidden not by its own choice but by the eyes of many beholders. The galleries, the traditional tea houses, the antique shops, and the caligraphy shops provide the urbanites with a little world of wonders where life can be a little more down-to-earth and the little world that seems disappearing. Insadong and the surrounding area were the residences of the officials, the extended royal families, and the previliged, Yang Ban. The antique art shops that began here during the Japanese Colonial Period started carrying everyday-things of this previliged class as many of these things became antiques in the face of "modernity." 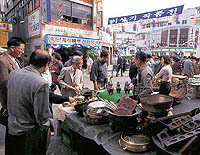 Insadong is also known for the caligraphy shops. The serene scent of caligraphy ink blocks, wording of which seems to diminish the pleasure all together, the brush and the paper attract the keen sensed along with many artist of Eastern tradition and Western alike. An earthenware of Shin Ra(Shil La) with a faint crack telling its story of a dozen and three centries, a little barnished boxes whose peeled corners recount its story; some come here looking for a piece of the past, some come for art exhibition, and some come here just to forget the burden of daily life.